Maybe there’s hope for France. When Greeks, Belgians, and the Brits riot, it’s because they want more handouts. The French, by contrast, have taken to the streets to protest higher taxes. And they have plenty of reasons to be upset, as the Wall Street Journal reports. France became the most heavily taxed of the world’s rich countries in 2017… The Organization for Economic Cooperation and Development’s annual review of taxes in its 36 members published on Wednesday showed the French government’s tax revenues were the equivalent of 46.2% of economic output, up from 45.5% in 2016 and 43.4% in 2000. The Danish government’s tax take, which was the highest among OECD members between 2002 and 2016, fell to 46% of gross domestic product from 46.2% in the previous year and 46.9% in 2000. …The rise in French tax revenues was in line with a longstanding trend… The average tax take across the organization’s members edged up to 34.2% of GDP in 2017 from 34% in 2016 and 33.8% in 2000. I suppose we should applaud Denmark for no longer being at the top of this list. 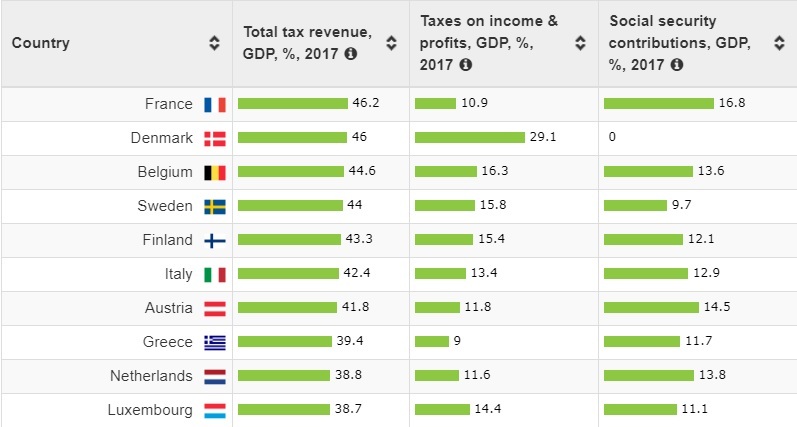 The tax burden on Danes is still absurdly high, but at least there is a small bit of progress (presumably because of a modest amount of long-overdue spending restraint). Shifting back to France, the WSJ story mentions that the French president had to retreat on his plan for higher fuel taxes. President Emmanuel Macron backed off a fuel-tax increase that enraged much of the nation and sparked a grass-roots protest movement against his government. …Before Tuesday’s climb down, Mr. Macron’s government had planned to raise fuel taxes in an effort to cut automobile pollution. …But the planned move sparked the worst riots to hit Paris in decades on Saturday, leaving the city’s shopping and tourist center dotted with burning cars and damaged storefronts. Protesters vandalized the Arc de Triomphe, rattling Mr. Macron’s administration and the country. For what it’s worth, I’m glad Macron backed down. He actually has some good proposals to liberalize the French economy. That’s where he should be focused, not on concocting new ways to fleece citizens. To be sure, over-taxation is not limited to France. Here are the most heavily taxed nations according to the OECD report. Income taxes and payroll taxes generate most of the revenue, as you can see. But keep in mind that all of these countries also have onerous (and ever-increasing) value-added taxes, as well as other levies. If I was in France (or any of these nations), the first thing I would point out is that people are getting ripped off. A huge chunk of their income is seized by tax collectors, yet they’re not getting better services in exchange. 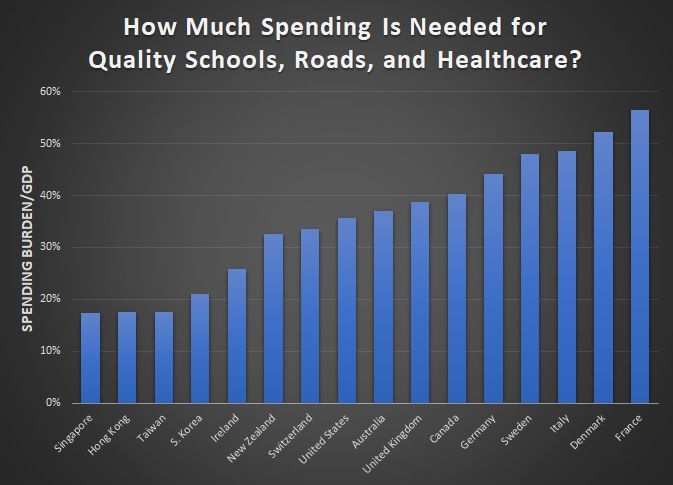 Are schools, roads, and healthcare in France better than they are in Switzerland or New Zealand, where the burden of government is much lower? Or are they better in France than they are in Hong Kong and Singapore, where the fiscal burden is much, much lower? The European Central Bank confirms that the answer is no. 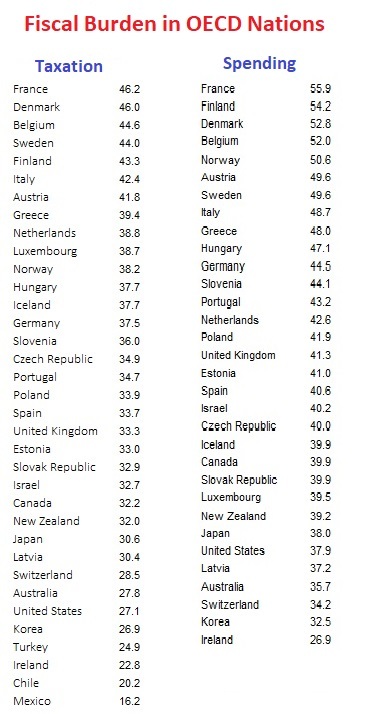 Here is the data on taxes and spending for OECD member nations. For some reason, not all countries in the OECD’s tax database are included in the OECD’s spending database. Regardless, the obvious takeaway is that big welfare states require confiscatory tax regimes (with the middle class getting pillaged). A few closing observations on this data. Governments also have non-tax revenues, so red ink is only a partial explanation for the gap between spending and taxes in various nations. Because of somewhat distorted GDP data, the actual tax burden in Ireland and Luxembourg is worse than shown in these numbers. From 1965-present, the tax burden has increased the most in Greece. Needless to say, that has not been a recipe for economic or fiscal success. The U.S. has a modest fiscal burden compared to other industrialized nations, which helps to explain why living standards are higher in America. Mexico is not a low-tax nation. Like many developing economies, its government is simply too incompetent and corrupt to enforce onerous tax laws. Circling back to our main topic, I joked years ago that the French national sport is taxation. It’s so bad that thousand of taxpayers have faced effective tax rates of more than 100 percent. Indeed, taxes are so onerous that even EU bureaucrats have warned taxes are excessive. P.S. I guess we shouldn’t be surprised that more than half the population would flee to America if they had the opportunity. Don’t hold too much hope for the French. Besides protesting the fuel tax, the Yellow Vests are also protesting a reduction in worker ‘protections’ and a change in the wealth tax. They seem more like Occupy Wall Street than Tea Party. You’re not entirely wrong, but the UK did have our own protests against high fuel taxes back in 2000 (with similar results: the government eventually threw a bone to the protesters without ever stopping to think more deeply about the problem of excessive taxation). Unlike those in Paris, they affected the entire country.